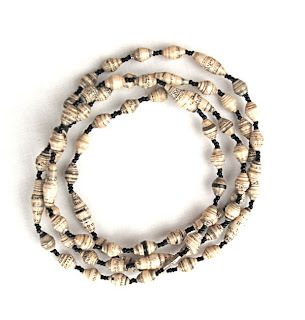 The Road Less Travelled: Suubi Beads - - UPDATED! Suubi Beads - - UPDATED! The Suubi (hope) project was launched in 2007 while the Hansow family was living in Jinja, Uganda for the adoption of their daughter. At the orphanage, they met Anaso Grace and Adong Santa selling paper-beaded necklaces. And after they visited the original 60+ women who met each Sunday to bead together under a jackfruit tree in the village of Walukuba, Suubi was birthed - merely a response to a talent and a need. Suubi (the Lugandan word for HOPE) is a project run by the non-profit organization Light Gives Heat. 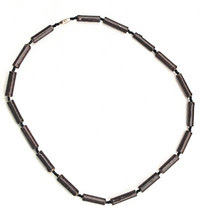 Suubi is the name of the self-governing community-based organization of beautiful women that make the jewelry, as well as the product name here in the West. 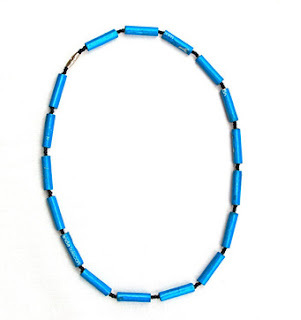 1) The Suubi (hope) project is about creating consistent weekly incomes in otherwise unemployable areas in Uganda through the purchasing and reselling of these hand-make necklaces. Thus, allowing for women to provide food and pay school fees for their children. 2) In Uganda, we have been shown a HOPE that doesn't make sense and has changed everything. Therefore, we simply want to spread HOPE - sharing the stories of these amazing women and getting people across the world to look outside of themselves and respond creatively. In addition to buying each week (and tripling their usual profit), the Light Gives Heat volunteers also run weekly Literacy and English classes for the women of Suubi and simply spend time with the women. The majority of the 120+ women are Acholi widows who have been displaced from Northern Uganda because of an over 20-year-long war that has directly affected their tribe and homeland. Despite the tragedies they have seen, the hardships they face, and the unpredictability of life in Africa, these beautiful women of Suubi have joy on their faces and hope in their hearts. As some of our volunteers have said, “America’s Next Top Model has nothing against these women.” They truly are an inspiration and they have taught us so much about life and choosing hope (daily). While in Ethiopia one of my room mates was telling me how she's involved with Light Gives Heat and I was challenged to get more involved when I got home. Sweet Katie lives in Uganda with her children, she challenges me and encourages my soul. Suubi beads are a great reminder to pray for her, her children, and make a difference in the lives of the women that make these necklaces. I always loved the necklaces, love the ministry, so it was a win win situation! $10 - I have 4 but I'm not sure on the colors yet. I love my Suubi beads. Do you have any of the large, colorful ones? 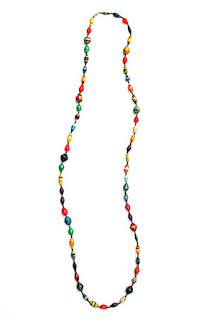 I have several strands of the smaller beads and my mom got some much bigger ones that I loved. Let me know!